The Look East Policy (LEP), originally conceived in 1991, was re-branded as the ‘Act East Policy’ (AEP) in 2014 in an attempt to adopt a more proactive foreign policy towards India’s Southeast Asian neighbours. Focus is to be laid on building people-to-people connectivity, with India’s Northeast and Myanmar serving as the core nodal points for access to the tiger economies of Southeast Asia. While Myanmar is viewed as a proximal partner in improving overland connectivity with the rest of Southeast Asia, Northeast India is meant to serve as a key ‘land bridge’ to the Greater Sub-Mekong Region. Both these waypoints also share a common cultural heritage, making it conducive for India to forge a long-lasting bilateral relationship. Out of the several connectivity projects in the pipeline, the trilateral India-Myanmar-Thailand highway is of prime importance. 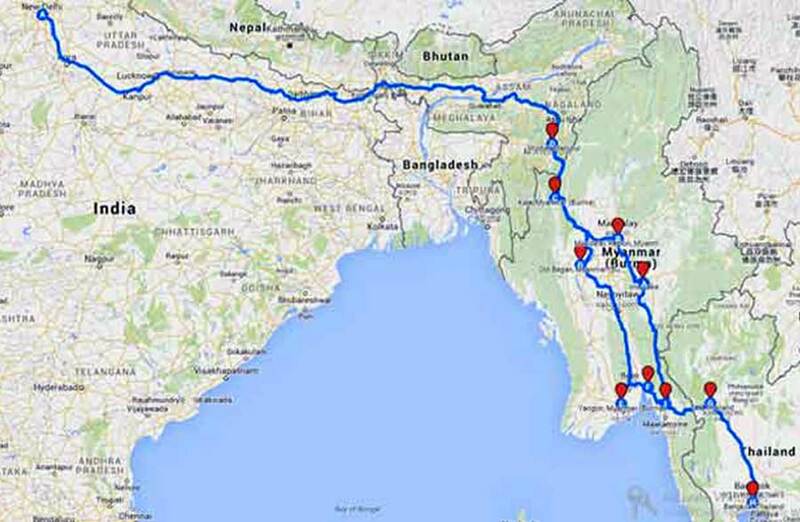 Proposed to run from Moreh (Manipur) to Mae Sot (Thailand) via Mandalay (Myanmar), the highway aims at establishing a direct vehicular link to Southeast Asia to facilitate greater ease of civilian transport and commercial trade. However, the highway passes through the Sagaing Division in west Myanmar – a hotbed for insurgent groups from Northeast India. In fact, the point of origin for the highway (Moreh) falls in Chandel district of Manipur, a highly volatile area contiguous to Myanmar that has witnessed a spate of violent insurgent attacks in the last two years. Indian state appears unclear on the specific security design to secure the border – whether to continue with paramilitary protection or switch to the army. Another overland linkage in the form of a Delhi-Hanoi rail link is still stalled in its first stage within Manipur, owing to the threat posed by regular incidents of abductions, extortion and illegal tax imposition by rebel groups. The border routes also overlie on a larger transnational network for arms and drugs trafficking along the threshold of the infamous Myanmar-Laos-Thailand ‘Golden Triangle’. Therefore, opening up India’s eastern borders before plugging these critical contraband gateways can backfire by perpetuating regional militancy. India signed a ‘legal assistance pact’ with Myanmar in 2010 that allows transfer of Indian insurgents from Myanmar to India contingent on mutual agreement. UPA-II also signed a MoU with the Myanmarese government in May 2014 on joint border patrolling and information-sharing. The BJP government too bilaterally discussed critical security issues with Myanmar during the first meeting of the India-Myanmar Joint Consultative Committee in July 2015. During this time, the Indo-Myanmar Regional Border Committee comprising of army and paramilitary officials from both countries also met in Manipur to discuss joint border action. However, the Indian state appears unclear on the specific security design to secure the border – whether to continue with paramilitary protection or switch to the army. There have been no joint patrolling exercises along the border, contrary to what existing bilateral agreements specify. Furthermore, the ‘hot pursuit’ cross-border raid by the Indian Army last year (the details of which are still not publicly available) exposes critical communication gaps between the two governments insofar as intel-sharing is concerned. This gap needs to be closed with more intimate and transparent diplomacy. Thus, the lapse in the security blueprint for India and Myanmar is largely in implementing existing policy, rather than introducing new ones. Beyond providing a ‘framework for action’, the existing arrangements have not achieved much, and militant groups continue to thrive along the border with considerable impunity. India must imperatively draw up a well-defined inland security pact with Myanmar that stipulates a clear and coherent strategy to contain border militancy. India must imperatively draw up a well-defined inland security pact with Myanmar that stipulates a clear and coherent strategy to contain border militancy. The ideal precursory approach would be to cut-off vital supply lines for the militant camps and degrade their resource pool by plugging contraband routes. The offensive design must fully incorporate Myanmarese security forces given the latter’s familiarity with the local topography. Also, focus must be laid on neutralising core insurgent infrastructure like camps housing the top-rung of militant leaderships rather than peripheral camps. Most crucially, a regular monitoring and periodic review mechanism must also be created to ensure effective implementation of the counter-insurgency blueprint. The Indian government must make positive use of the change of guard at Naypyidaw. The coming of the National League for Democracy (NLD) to power can usher in an era of transparent and committed diplomacy, which could reverse the bilateral lapses and shortcomings that India faced with the previous government. Thus, this seems to be a good time to consolidate the Act East Policy and ensure sustainable security for the eastern border corridors.